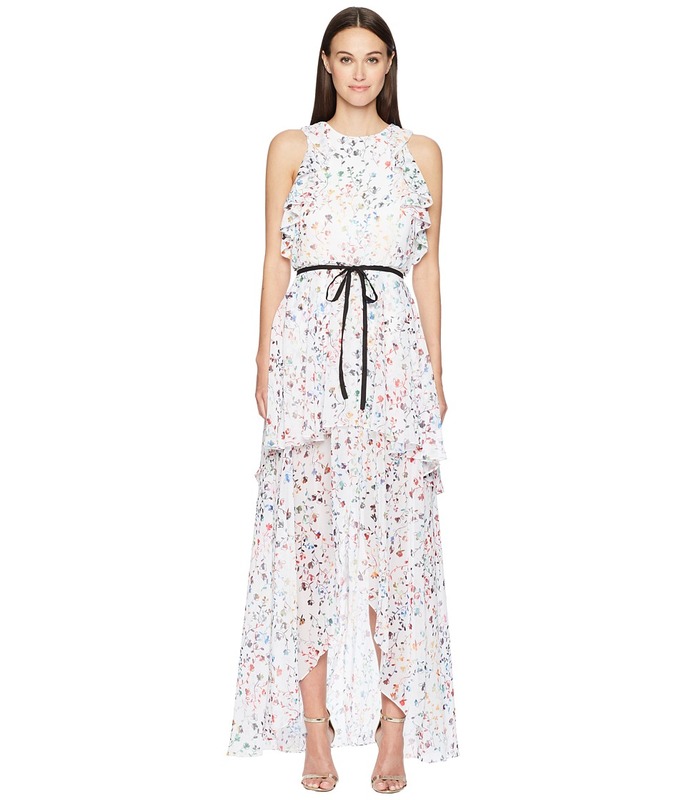 You will be a flowing vision of beauty wearing the ML Monique Lhuillier Sleeveless Tie Waist Garden High-Low Dress. A-line silhouette. Jewel neckline. Sleeveless. Ruffle trim at arms. Back zip closure. Fitted waist. Belt loops. Removable waist tie. Tiered skirt. Allover colorful floral print. Asymmetrical hemline. 100 percent polyester. Lining: 97 percent polyester, 3 percent spandex. Professional dry clean only. Imported. This item may ship with an attached security tag. Merchandise returned without the original security tag attached or a damaged tag may not qualify for a refund. Measurements: Length: 62 in Product measurements were taken using size 2. Please note that measurements may vary by size.